SALY, Senegal (AP) — Timothy Ighoefe is an intimidating defender at 6-foot-11 and 245 pounds. Still, the Nigerian knows he must improve if his decision to play basketball instead of soccer is going to pay off and take him to the NBA. In other words, there’s potential but it’s a work in progress — just like Africa itself for the NBA. “It’s a continent with over a billion people, with a fast-growing economy, fast-growing young urban population. That’s a good recipe for the NBA long term,” said NBA deputy commissioner Mark Tatum, also in Senegal for the training facility opening. The NBA has big plans for Africa. An office was established eight years ago in South Africa. There’s an annual exhibition game featuring NBA stars. Another step is the new training center, built on the campus of a soccer academy in a coastal resort town 45 miles south of the Senegalese capital Dakar. Saly, a former Portuguese trading post, is now a getaway spot for Dakar’s upper class and is home to many French people. The academy is one of seven around the world, with three of them in China. It features fulltime schooling and training. It can accommodate 24 boys selected from English- and French-speaking African countries. The NBA holds camps for elite African girls, but there’s no center for them yet. The teenage boys begin their days with a light workout at 5:30 a.m. Then it’s breakfast, school, lunch, school, gym. They’re coached by former NBA and NCAA players and have traveled to Australia, Europe and the United States for tournaments. “We’re trying to find a way to do it quickly, to be able to work with some of those leagues, to work with our partner FIBA, to get something up and running sooner rather than later,” Tatum said. Africa lacks good infrastructure, but Tatum cited the new Dakar Arena, as well as Rwanda’s plan for a new facility, as incentive for the NBA to bring games here. 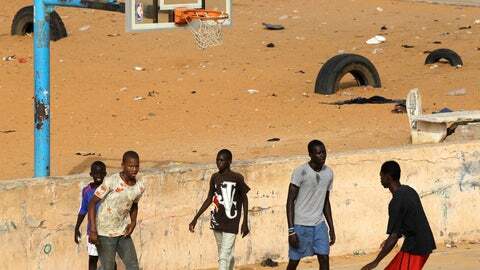 He called the Dakar Arena a “world-class facility” but wouldn’t confirm the Senegalese sports minister’s announcement moments earlier that it would host the NBA exhibition game next year. China is a huge success for the NBA, so it’s often compared to the league’s initiatives in Africa.